This blog is a journal of the simple living on a small 2 and a half acre farm. The ups and downs. The good and the not so good. 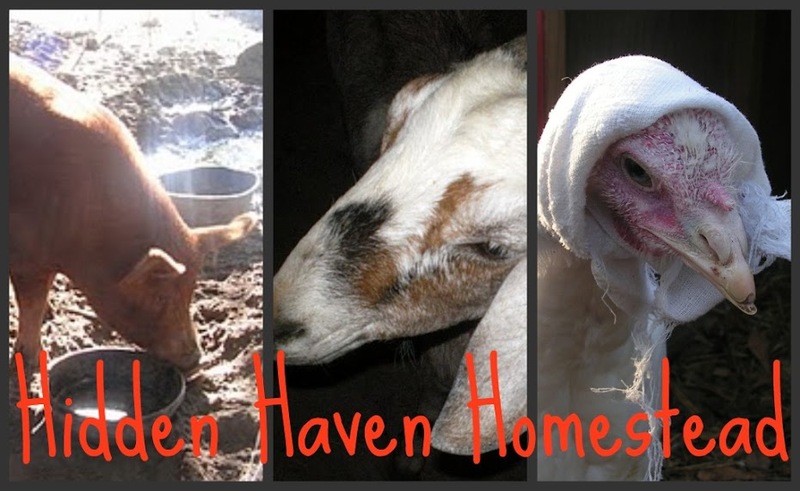 Adventures of Hidden Haven animals and some of my own. The sharing of our frugal, hardworking, attempt to be as self sufficient as possible. Please stop by often as we love company! Some days just seem to start off bad and go down hill from there. I got up and started a load of laundry before heading out to walk Kuma and Rusty. When we came back inside the kitchen floor was flooded. Seems William left a screw in his pocket and it punctured a hole in the outer tub of the washer. Using a ton of towels I got the water all cleaned up, leaving me with even more dirty wet laundry. I go out to feed and find that Tessa had gathered all her babies underneath her for the night. The night that the low was 89F! She lost ALL her sweet little baby turkey. They overheated underneath her. She was very upset and so was I. I go to feed Tinker and find that she is holding one of the ducks down with her front paws. She being that she is a livestock guard dog has decided the ducks are not allowed to come to the goat side of the pen. She keeps the goats on one end and the ducks on the other. Tinker didn't bite or try to hurt the duck she just stopped the duck from going near the goats. If she took her paw off the duck it ran toward the goats end to get away from her so she would sit down with her paws over the duck holding it down. I got the duck from her and took it to water to drink. Don't know how long she had it held down but the poor duck just drank like crazy. After breakfast we go see if we can find the special glue we need to repair the washer. The pickup decides not to crank when we come back outside the store. When we get home I find Whiskers carrying a squirrel he has caught up on the back porch. The poor thing didn't make it. Even though the washer broke I have my washtubs and wringer that I love so laundry got done and I had time to think and watch the birds while getting it done The glue is ordered to repair the washer and will be here in a few days Until then I will have the time to enjoy the birds and thinking while washing in the washtubs. Tessa lost her babies but we at least know now she and Fred can hatch babies. She also still has her 2 chicks she hatched and is mothering over them. Tinker may be a puppy but is turning out to be a good guard dog for our animals. The duck has learned where it needs to be to stay out of trouble and Tinker patrols her domain with pride. The pickup was a simple thing that was fixed in a matter of minutes.The squirrel didn't make it but Whiskers the cat has proven to be a very good hunter of snakes as well so can count on him to keep those pests away. Things go wrong. Things break. We stress. We worry. It's just part of life. God never promised us a perfect life here on earth. If everything was happy, healthy and perfect then why have heaven? What would we have to look forward to? Things that go wrong in our lives aren't God's doing. He gave each of us a mind and a heart for a reason. So we could think and do for ourselves. So even though things might go wrong and I stress out there were still blessings to count at the end of the day. Take care. Hope tomorrow is more quiet! My good news is that we got over an inch of rain late this afternoon and tonight... Yeah Rah!!!! Hang in there... Tomorrow is a brand new day!!! I understand, really I do and you are right about God doesn't promise everything to be perfect. The way I try to look at things, is that we're being refined and that isn't always an easy task, for us or God. Just two weeks ago we had to put down our beloved horse. He had an elarged spleen and medication simply didn't work and surgery wasn't an opion as it cost $4-5,000 and there are no guarantees. It was the hardest thing we've ever had to face in our homesteading life, but we know it was the right choice as he was suffering. Glad you had William to help with the truck. Tell him to empty his pockets. What is it with boys and men and things in their pockets? Hi Peggy, Some days are just worse than others! I hope today is a better day. God bless you all dear friend. Hi Peggy ~ What a day , those days happen though. I had one last Friday , glad they don't come often. Sorry to hear about Tessa's wee one's. Tinker sounds likes he's doing a wonderful job and takes it seriously. Love your positive attitude !! Today is a new day, hope it is a quiet day on the homestead. God Bless. Oh Peggy, what a sad day! I still don't know how you do it but you do. I'd be crying all over the place, especially at the squirrels death and the loss of the turkey babies, I can't bear these things. Two of our dogs are killers of little things and I load their collars with bear bells every time I let them out hoping it will give the little creatures fair warning. It somewhat works and I think the dogs know that they can't chase with out making a noise. I hope things get better for you, I'm sure they will. When you've taught William to empty his pockets will you please then teach my hubby too???? Praying God's blessings on your dear friend, it has been a bad day, but look to Jesus he has all the joy, hugs my friend. We've had rain past 2 days:o) Still hot . Just discovered your blog. What a great outlook on a not so good day! I will be going back to read what I have missed. I am a COUNTRY girl who is having to live the CITY life. I SO miss living in the country and how I wish I had your animals around....At any rate, I plan to live vicariously through your blog! Oh my goodness Peggy that was a sorry day... and yet nature will take it's course and isn't it telling that Tessa lost her babies out of sheer love for them? thank you for that post Peggy. I seem to be going through the same thing lately. we need a new roof. our dishwasher is dying, our brand new washer went ka-put and a foster dog has been in the hospital for almost 2 weeks. but the roof will get repaired, a new disher with rebates, washer will be replaced for free and the dog comes home tonight! Dear Lord, remind us that our time here is limited and that knowing and pleasing you should be the work of our life. Amen.